Hello Friends! I thought I would spend a few moments responding to the free-motion quilting concerns you shared on my giveaway of my Learn to Machine Quilt post. You still have till 12am EST 8/7/2014 to enter the giveaway. 1. Runaway stitches – help! Wendy’s 2 cents: I remember the runaway stitches well, especially during my learning curve stage. It still happens to me sometimes when my family startles me when I am quilting, or when Miss Baby decides to snuggle right next to me when I am trying to quilt a large quilt. When runaway stitches happen, I would either leave them be or rip them out depending how bad they are (or how much time I have). To minimize the running away of stitches, I would mentally brace myself when my stitching comes near a stopping point. Then, I would slow down my stitching (very important! ), and make sure I have my hands well on the quilt sandwich so that my quilt sandwich doesn’t veer in any direction — before taking a few tiny bites to tie off a particular stitching path if I am at a spot where I have to cut off my threads. 2. Struggling with bobbin tension -help! Wendy’s 2 cents: I am thinking bobbin tension was raised as a concern because oftentimes quilters try to match their bobbin threads with the backing fabric they use, which oftentimes are of different colors they use for their top threads. They then find out no matter how they tweak the settings (top and bobbin), sometimes, the bobbin threads would still show up on the quilt top. VERY annoying, I know! Instead of fighting, I take the easy way out. I always use the same threads for my top and bobbin threads. That way, I don’t have to waste my time trying to fine tune fine tuning my settings. More often than not, my bobbin thread colors do not match my quilt backing fabric. But the results can be visually striking on the back, as shown below. 3. Give your quilting some time to simmer! 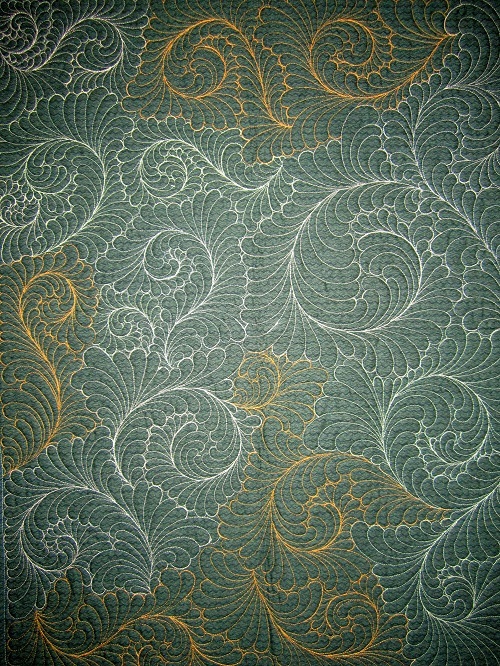 French 75 Quilts left the following comment on the Learn to Machine Quilt Class giveaway post. Wendy’s 2 cents: Boy, truer words have never been said when it comes to evaluating your own quilting – especially for those who are braving the learning curve stage. It is true!!!! I have taught students who start out being really critical of their own quilting, noticing the uneven stitches here and there. BUT after they have quilted a larger area, walked away, and come back to look at their quilting again – inadvertently, the comments are always, “It looks better than I thought”, or “It is actually not that bad.” I don’t think that is falsely consoling oneself. I think when we go back to look at our quilting after it “simmers”, we look at the big picture and are taken by the overall texture reflected by the light from those quilting stitches. 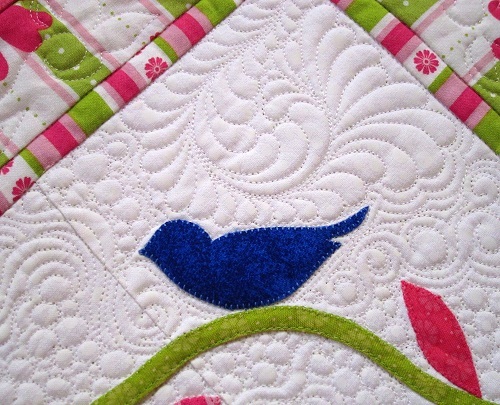 You can be sure I have BAD stitches in the quilting shown below…! But you tend to see the overall big picture, don’t you? 4. Uneven stitching speed – help! Wendy’s 2 cents: My stitching speed is actually not constant. The reason being sometimes when rounding a corner or stitching in tight spot, I have to really concentrate – and so I slow down! So, to those who struggle with uneven stitching speed, I say as long as your stitches are even, it’s okay to vary your stitching speed. I mean, we don’t drive at a constant speed at all times because there are always unforeseen things on the road, and so we adjust our driving speed accordingly. I think that’s the same concept. When I first learned how to drive, a friend advised me not to drive faster than I could see. I have applied that same principle to quilting. I never quilt faster than I can see! 5. Struggling with quilting large scale – help! Wendy’s 2 cents: I actually think it is easier to quilt small on a domestic machine. But it is possible to quilt large scale if — 1. You have quilted the motif in small scale, and 2. You are VERY familiar with the stitching path. 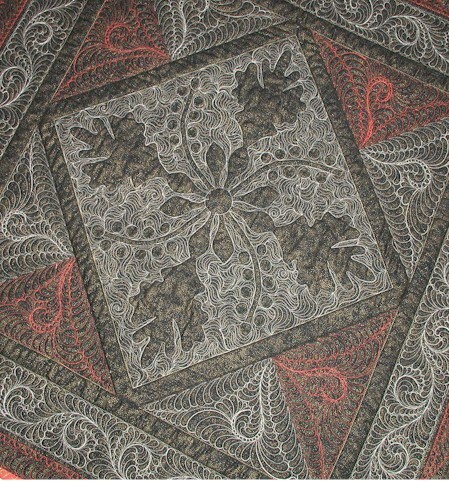 Taking care of those two variables first and foremost will really help in large scale quilting. Then, as you quilt, every so often, come out for air and survey the territory on your quilt yet to be quilted, and proceed from there. Then, finally, don’t be nervous. Just…. 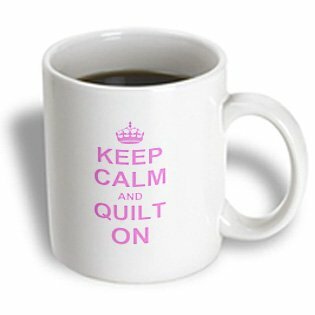 keep calm, and quilt on! Don’t you love that mug? I would love to have one. You can purchase it here. Image below is borrow from the purchase link. Thank you for stopping by! Stop back by tomorrow for the announcement of the winner of my Learn to Machine Quilt class! Have a blessed day, Dear Friends. Great tips Wendy, thanks for sharing! For all of you waffling about taking Wendy’s class, it is well worth it. 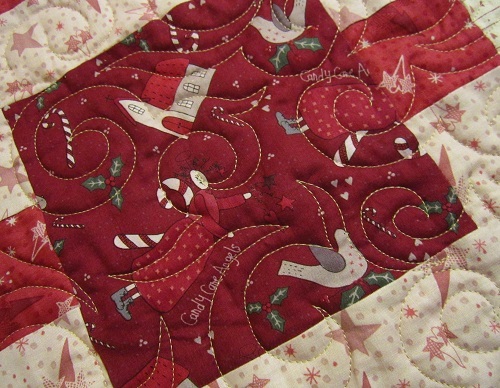 I’d been working on learning free motion quilting for a while, took the class when it was first offered, and it was like a light bulb came on–it all made sense after watching Wendy. I’m almost finished free motion quilting a queen size quilt on my home machine, lots of feathers & pebbles. A couple of years ago I wouldn’t have dared to try this. Thanks Wendy for your help and all your tips!! I am loving this Q&A session in your posts. I think what I am learning from it will help me a lot. And it is giving me the courage to keep trying. 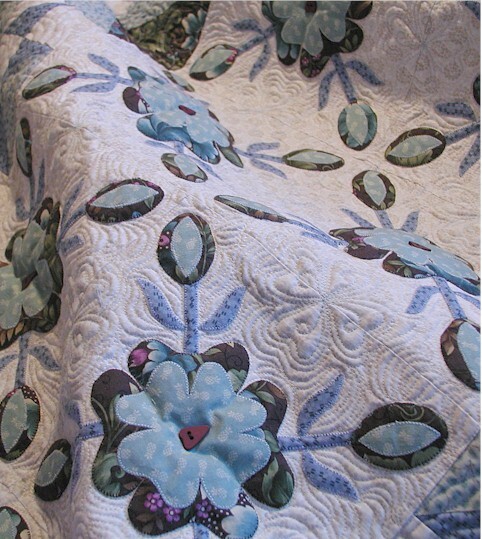 Oh every time I see that blue and white quilt I want to make one just like it. I think I bought the magazine too. Must see if I still have it. It’s gorgeous. Thank you so much, Wendy, for sharing your tips! They are all very good and helpful! This is my first visit to your blog and already I’ve learned so much!! I’m new to FMQing and appreciate all the help I can get. Thanks so much. Nice blog. I’m super impressed with your writing talents. Each option has its own merits and demerits that can ease decision making when broken down. Thanks for finally talking about this!